Although it has been some time since I’ve posted, I’d thought I’d feature a project that I really enjoy knitting for friends–bracelets! I recently made this bracelet for an amazing lady’s birthday present. Before sealing it up in the gift box, I took a few pictures for julepstyle. Each knitted bracelet I’ve made has been very different, but I’m pretty pleased with how this bracelet turned out. 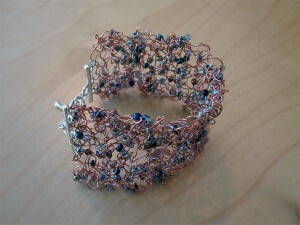 I didn’t really take enough images to do a tutorial, but I can briefly explain how I made this bracelet. 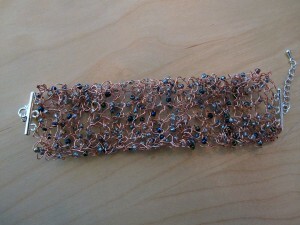 I start with 24 Gauge, Tarnish Resistant Copper Wire . 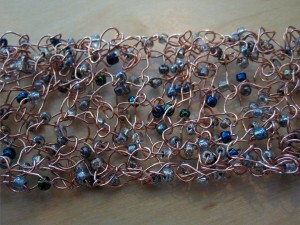 To incorporate the beads into the bracelet, they need to all be on the wire before you begin knitting. Thread about 3-4′ of beads on the wire. (I am never really exact about this; I always err on the side of too many beads, because once you start knitting, you can’t add more.) Then start knitting! For this bracelet, I cast on 7 stitches (has to be an odd number for me) to size 8 metal circular knitting needles; I think my normal bamboo needles might be damaged by the wire over time. The whole bracelet is done in garter stitch; each time you make a new knit stitch, just bring up a bead and use it in the stitch. Keep knitting until the bracelet’s the desired length. There is some give with the metal; you can stretch it or compress it if you need to after it’s finished. I haven’t been able to find copper clasps that I am happy with, so I just used a shiny silver clasp that blended with the bead colors. 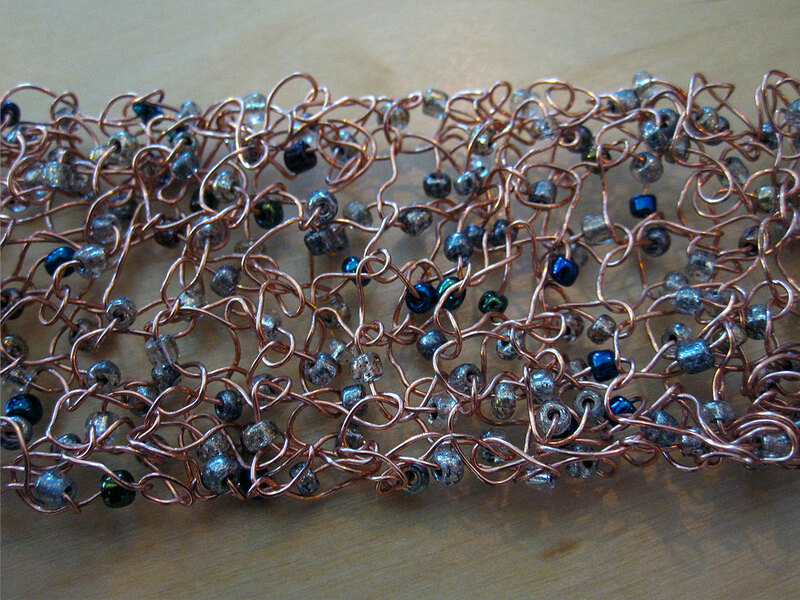 Just space the jump rings evenly over the ends of the bracelet, and it’s finished! I love your braclet! I am thinking of making one for me!